A £750m regeneration plan for the old MG Rover factory in Birmingham has been unveiled, three years after it closed. A new Longbridge town centre and 2,000 homes are planned on the 468 acre site. 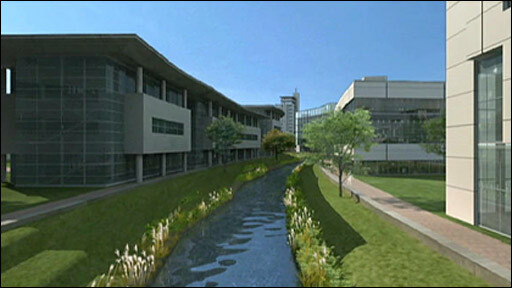 Bournville College would also move there while three parks would be created and the long-hidden rivers Rae and Arrow opened up. The factory closed in 2005 with MG Rover's collapse. Nanjing Automotive is set to resume car production in the remains of the plant in August. The Chinese firm, which bought the MG Rover assets, leases a third of the site and earlier this month announced that the old MGTF sports car would be the first vehicle to be made there. The company also said it intends to make up to four different models in Birmingham over the next five years. Property developer St Modwen and the regional development agency Advantage West Midlands have submitted planning applications for mixed use development of the factory site. 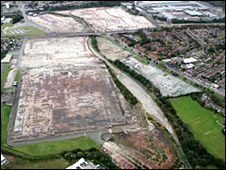 The plan for the Longbridge site is one of the biggest redevelopment projects in the UK. In recent months many buildings have been demolished to make way for the new construction. It is part of the Longbridge Area Action Plan, which is expected to help create 10,000 new jobs over the next 15 years. The new town centre, just off the A38 Bristol Road South, would form a new heart for the community, developers say. Bournville College would relocate to a "Learning Quarter" featuring a new purpose-built £84m educational facility, expected to open in 2011. There would also be a new recreational area including "Austin Park" at the heart of the town centre and "Rea Park" on the western side of the development. 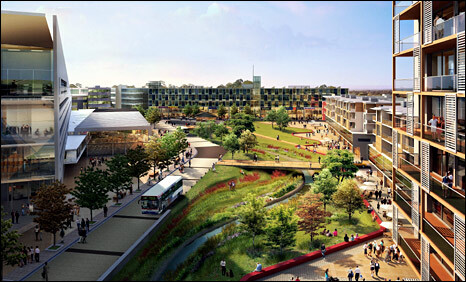 Longbridge East, which used to house the engine plant, would feature another dedicated public open space, known as "Arrow Park" at the core of what would be a new residential community. The long-forgotten rivers Rea and Arrow would be opened up for the first time in decades and would be a feature of the new Longbridge. In all, four planning applications are being submitted for construction covering a total of 468 acres. Bill Oliver, chief executive of St Modwen, said: "Longbridge is a site with a world-renowned heritage and today we have moved this area of the Midlands into a new and incredibly exciting era." There had been concern amongst some former MG Rover workers that progress on the Longbridge development was too slow and that promises made about new jobs had not been honoured. 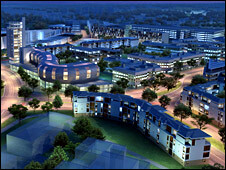 But St Modwen has maintained that it takes time to plan the regeneration and create the jobs. It said a new innovation centre had already helped to provide some new jobs and more than 100 people were currently employed by Nanjing as it geared up for production of the MGTF. The plans have to be approved by both Birmingham City Council and Bromsgrove District Council. However, Mick Laverty, chief executive of Advantage West Midlands, said: "Today represents a major milestone for Longbridge. "Having consulted with the local community over recent years, all parties involved in taking the project to its present stage are acutely aware that there is a real sense of expectation and hope around a brighter future of Longbridge."